The most memorable comics to me remain the ones I read a few decades ago as a kid. The images etched into my brain and the dialogue still ringing in my head. Some of those books were indeed note-worthy. The O'Neil/Adams Green Lantern/Green Arrow for example. Others I kind of wish I could forget. There was a particularly bad 1976 issue of Archie that still haunts me -- especially that splash page of Archie racing down the stairs crying about his broken platform clog. But both of those types of comics, as well as all the not-great-but-not-bad ones in between, stick out more strongly in my memory than some more recent works that are particularly well-done. Why should I have better recollection of a mediocre comic I read decades ago than a stellar one I read last month? I suppose nostalgia plays into that at some level, but a lot of the bits I remember don't hold any emotional weight with me. I can remember the stories and the art, but not that they really spoke to me in any significant way. There are some books I certainly do feel nostalgia for, but not most of them. 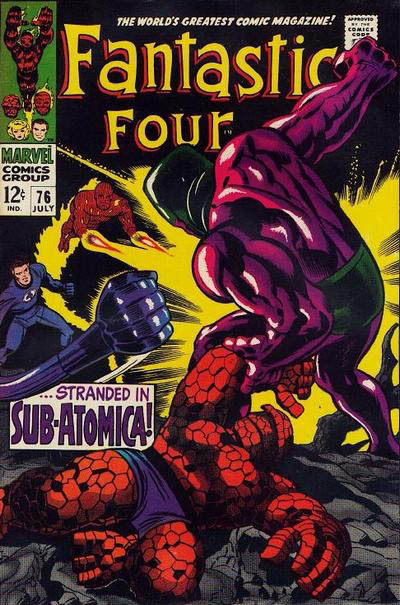 When I was in my early 20s, I was at a comic convention and came across a copy of Fantastic Four #76, which had been on my "want list" along with a host of other old issues from that title. I don't recall what I paid for it, but I'm assuming it must have been reasonably priced. When I got the issue home, though, I discovered that I had already bought a copy sometime previously. TWICE! I bought one, read it, forgot it, bought another copy, kicked myself for buying a second copy, forgot that, and bought a third copy! That was when I realized that I was no longer able to keep track of what I did or didn't have with an easy mental checklist. My want list had grown too large and too varied to remember. When I was I kid, before I was really a deep fan of comics, I would only read a new comic once every few months on average. I couldn't really afford any on my own, so I basically had to rely on gifts at that point. When I first started getting into them, I got exactly one new comic a month. A year or two later, that got upped to three comics a month. It was six by the time I graduated high school. But that one new comic a month bit? Twenty-two pages of story. I re-read books, of course, but new material (for me) was coming at a rate of less than a page a day. These days, I regularly read a minimum of 40-50 pages of new material every day (via webcomics) not to mention various manga and graphic novels when I can. In fact, I've only been able to read one 168-page graphic novel and half of a 142-page one this week on top of those regular 40-50 pages because it's been an especially busy week. I'm not saying that to try to brag -- I have no clue how that compares to others' reading habits -- but to just to point out that it's a phenomenally huge increase compared to what I was reading as a kid. In the past five days alone I've read 20 times the volume of new material that I used to read in a whole month! So it should come as no surprise that I don't recall stuff from last week as well as from last century. I had more time to commit individual comics to memory because they weren't competing with each other. Any given issue of Superman or Action Comics that I might've gotten needed to tide me over for a couple of months, not a couple of minutes. So I'm certain I spent much more time with each book back then. The relative isolation in which each comic was read back then made them stand out more. I read through so many now that they wind up blurring together a bit more, and it's harder to remember them. Just like it was easier to remember which Fantastic Four issues I was looking for when I was ONLY looking for Fantastic Four back issues. And how I started re-buying issues because I was also trying to look for their appearances in other titles, back issues of Avengers and the first appearances of Moon Knight and Punisher. I do enjoy the comics I read today. I'm a little disappointed that I can't retain the memories of them more vividly, relative to those books I read as a kid, but only inasmuch as it's a failing on the part of my memory. I don't care to dwell on what's already happened, and I'd rather spend my time looking forward to new cool things. I'll enjoy the new books as they come out and move forward. Say, how soon until the next volume of Bakuman comes out anyway?